FIGURE 4 Erythematous form of oral candidiasis of the palate. Source: Courtesy of the International AIDS Society-U.S.A. From Refs. 3, 4, 11. FIGURE 6 Erythematous candidiasis on the dorsal tongue surface. Source: Courtesy of the International AIDS Society-U.S. A. From Refs. 3, 4, 11. FIGURE 7 Angular cheilitis. Source: From Ref. 21. Pseudomembranous candidiasis is the most common form, accounting for 70% to 80% of all cases. The lesions appear as soft, white, curdled papules, which increase in size and can coalesce, forming large whitish or creamy plaques, which typically are easily dislodged when scraped by a tongue blade, revealing an erythematous base. They can form in any area of the oropharynx and often at multiple sites in the esophagus. Erythematous candidiasis may coexist with plaques or present by itself, usually as red macular coalescing lesions on the dorsal tongue (median rhomboid glossitis) or forming a mucous surface eruption (enanthem) over the hard and soft palate. Angular cheilitis is a commonly overlooked manifestation of oral candidiasis, manifesting with ulceration and erythema over the oral commissures. The diagnosis is usually made clinically from the history and physical examination with the characteristic lesions; a swab smear submitted to the lab for a rapid potassium oxide (KOH) preparation in the pseudomembranous form, or biopsy for more specialized periodic acid-Schiff (PAS) or Giemsa stains in other forms can readily demonstrate an abundance of spores and hyphae (Fig. 8), strongly supporting the diagnosis. Culture is not useful in establishing the diagnosis, since the fungus will be present as normal flora in samples of healthy volunteers, but it can assist in identifying the causative species for sensitivity testing in cases of treatment failure. When atypical or mixed lesions are simultaneously present in the oral cavity (for example, erythematous plaques and ulcers), empiric treatment for candidiasis is warranted. In cases of azole treatment failure or if there is clinical presentation consistent with concurrent esophagitis, a barium swallow may reveal a cobblestone appearance and upper endoscopy may reveal whitish ulcerative plaques; biopsies should be performed for culture and to rule out other pathogens including herpes simplex or cytomegalovirus (CMV), or lesions such as lymphoma or KS (6). Topical treatment can be with nystatin either as tablets or as troches (100,000 or 200,000 units) dissolved slowly in the mouth four times daily between meals for two weeks, or with clotrimazole 10 mg troches dissolved in the mouth slowly four to six times daily for two weeks. FIGURE 8 Potassium hydroxide preparation of oral smear showing fungal pseudohyphae and spores. Source: From Refs. 3, 11.
the area under the curve (AUC) of the antiretroviral agent, and posaconazole looks promising in cases of fluconazole-resistant strains. Intravenous amphotericin B deoxycholate can be used in cases of fluconazole-resistant strains; the lipid intravenous (IV) formulations of amphotericin B (Amphotec®, Abelcet®, and AmBisome®) have shown similar efficacy. The new antifungal class of echinocandins, with two agents available so far, is efficacious in treating azole-resistant candidiasis; caspofungin and micafungin are both available IV. Prognosis is usually good for mucocutaneous candidiasis, in contrast to invasive disease. Cryptococcosis. The second most commonly encountered fungal OI in HIV after candidiasis, Cryptococcus neoformans infects 8.5% of patients at some stage of their disease and in its disseminated form represents by far the most common life-threatening fungal infection in this patient population. It is a ubiquitous fungus found throughout the world and can also infect immunocompetent hosts. The most commonly involved organ is the CNS, followed by the lungs. Patients present with days to months of malaise, fever, headaches, and nausea or vomiting, as well as altered mentation, personality changes, loss of memory, and cranial nerve palsies. Mucocutaneous involvement occurs in up to 10% of cases, usually in advanced HIV disease (CD4 cell count <50/mm3), and skin lesions may occur weeks or months before presentation. Disseminated infection can present with cutaneous skin-colored or pink umbilicated lesions, which are, in general, asymptomatic, resembling molluscum contagiosum (Fig. 9) and are most often found in the head and neck area (14). Other types of cutaneous lesions include pustules, cellulitis, ulceration, panniculitis, palpable purpura, subcutaneous abscesses, and vegetating plaques. Oral cavity nonhealing ulcers or nodules can be seen alone or along with cutaneous lesions (3). Hematogenous dissemination of Histoplasma capsulatum or Coccidioides immitis can produce identical skin lesions on the face. Biopsy of the lesion is usually necessary for definitive diagnosis, by demonstration of cryptococcal yeast forms with hematoxylin and eosin, PAS, or methen-amine silver stain. Often, a Tzanck smear obtained by scraping the top of a lesion shows multiple encapsulated and budding yeast forms stained by Giemsa or by India ink preparation. C. neoformans can also be isolated on culture of the skin biopsy specimen. Histologically, all lesions reveal numerous encapsulated cryptococcal organisms. Crypto-coccal meningitis is treated with IV amphotericin B and oral 5-fucytosine or with fluconazole. Mucocutaneous cryptococcal lesions resolve two to four weeks after beginning effective primary antifungal therapy, but relapses occur in over 50% of patients once primary induction therapy is stopped. Chronic prophylaxis with fluconazole is effective. 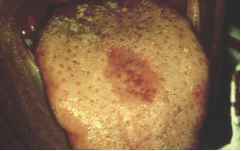 FIGURE 9 Cryptococcus neoformans, skin lesion. Source: From Ref. 22. 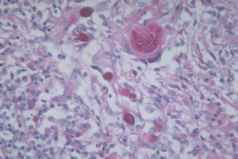 FIGURE 10 Histoplasma capsulatum organisms inside a macrophage, biopsy, Giemsa stain. Source: From Ref. 24. 100 cells/mm3. It may present as persistent, large, nonhealing ulcers or ulcerated nodular or exophytic lesions of the oral cavity, esophagus, other areas of the gastrointestinal (GI) tract, the larynx, or the nose, (15) usually along with systemic manifestations such as fever, diarrhea, splenomegaly, and cytopenias from bone marrow infiltration. Meningitis, adrenal failure, or endocarditis may develop. Cutaneous dissemination occurs in about 10%, presenting as nodules, macules, or panniculitis. Often the lesions are suspicious for malignancy; biopsy for culture and fungal stains of a suspicious or nonhealing lesion closer to the periphery are helpful for diagnosis, demonstrating granulomatous infection and the characteristic fungal elements, often filling the macrophages (Fig. 10). Detection of the fungal antigen in urine is another sensitive and specific test used for the diagnosis of active disease. Lipid formulations of IV amphotericin induction followed by oral itraconazole or fluconazole are often used for treatment, followed by secondary prophylaxis (16). Primary prophylaxis is considered in highly endemic areas if the CD4 count drops below 100 cells/mm3. Prognosis varies with the degree of immunosuppres-sion, extent of the infection, and response to treatment. 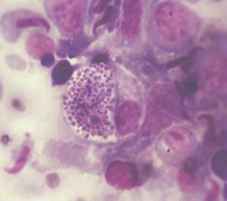 Coccidioidomycosis ("San Joaquin Valley fever"). The endemic dimorphic fungus C. immitis is found in the semiarid areas of the Sonora desert of the Southwestern United States, Mexico, and Central and South America and when in the mold form (arthroconidia) (Fig. 11) can cause pulmonary infection when inhaled. Disseminated infection usually represents reactivation and can include the CNS and bones in HIV/AIDS-infected persons or immunocompetent hosts (17). 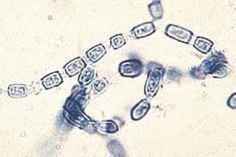 FIGURE 11 Coccidioides immitis infectious form (arthroconidia). Source: From Ref. 25. Cutaneous lesions resemble molluscum and are often ulcerated. Any osseous head and neck structure can be infected by the fungus (maxilla, mandible, parietal, frontal, pre-, and paravertebral areas and temporal bone), and infections of the retropharyngeal space, trachea, larynx, lymph nodes, orbit, and thyroid have been reported (16). Diagnosis is usually made by biopsy for stains and culture and histopathology to rule out malignancy. Fungal stain of the tissue can reveal the characteristic C. immitis spherules of the yeast form (Fig. 12). Serologic testing for specific antibodies by complement fixation is useful in establishing the diagnosis and following response to treatment. Fluconazole, posaconazole, and IV amphotericin B have been used for treatment. Surgery is sometimes necessary for debridement of the infected devitalized tissue. 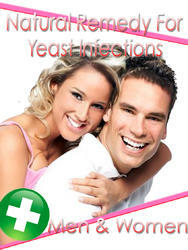 Prognosis varies and mostly depends on the site and extent of the infection. Aspergillosis. The genus Aspergillus is another worldwide ubiquitous fungus, which has the ability to infect human hosts, and although invasive aspergillosis is rare in HIV disease, it can present as a primary cutaneous infection with pustular lesions, or as a necrotizing angioinvasive disseminated infection of the lungs, tracheobronchial tree, nasal cavity, sinuses, and other sites. Risk factors for invasive aspergillosis in HIV disease include leukopenia and therapy with corticosteroids, broad-spectrum antibiotics, and antineoplastic agents (16). Skin lesions appear as skin-colored to pink umbilicated papules resembling molluscum contagiosum. Diagnosis is established by biopsy for stains and culture. Serum antigen testing for Aspergillus galactomannan is useful in supporting the diagnosis of invasive disease. Despite treatment with newer azoles, such as voriconazole or posaconazole, or IV amphotericin B, prognosis remains grave. Penicilliosis. The dimorphic fungus Penicillium marneffei is the third most common OI in HIV-infected residents of Southeast Asian countries and the southern part of China. The clinical presentation includes fever, weight loss, cough, anemia, and disseminated umbilicated papular skin lesions (in 71%), occurring most frequently on the face, pinna, upper trunk, and arms, and oral lesions including papules and ulcers. In addition, P. marneffei preferentially disseminates to the lung and liver. Diagnosis is usually by tissue or cytologic examination; treatment options include itraconazole and IV amphotericin. Blastomycosis, Geotrichosis, and Sporotrichosis. 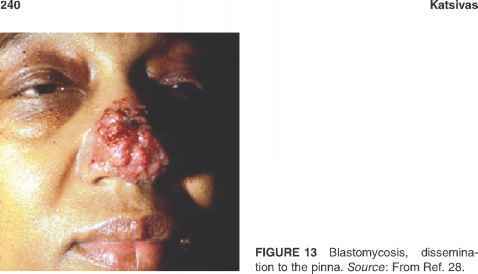 Infections with Blastomyces dermatitidis are endemic to the Midwestern and south-central United States, presenting as localized pulmonary infection, or as disseminated disease, occasionally as crusted papular ulcerated facial lesions (Fig. 13). Both Geotrichum and Sporothrix genera can cause skin lesions or oral nonhealing ulcers or erythematous lesions which resemble candidiasis (13). FIGURE 12 Coccidioides immitis spherule in tissue, PAS reaction. Source: From Ref. 26.